Honor the Year of the Snake -- Snow date show! Someone keeps sneaking into the Banquet Hall and gobbling up decorations meant to honor the Year of the Snake. Could it be the mysterious Snake King? Or a cranky monkey who wishes the banquet were in his honor? We missed the chance to welcome the Year of the Snake because of a big snowstorm in February. Come honor it now with Margaret Moody of Galapagos Puppets! 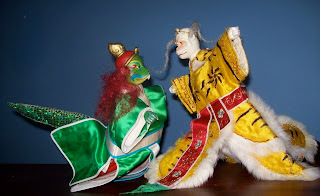 Stay after the show for oolong tea and puppet-play.